"SH-60" redirects here. For other uses, see SH60 (disambiguation). This article is about the naval versions and operators of the S-70 family. For an overview of the S-70 family, and for its civilian models and operators, see Sikorsky S-70. A U.S. Navy SH-60B landing on USS Abraham Lincoln. The Sikorsky SH-60/MH-60 Seahawk (or Sea Hawk) is a twin turboshaft engine, multi-mission United States Navy helicopter based on the United States Army UH-60 Black Hawk and a member of the Sikorsky S-70 family. The most significant modifications are the folding main rotor and a hinged tail to reduce its footprint aboard ships. The U.S. Navy uses the H-60 airframe under the model designations SH-60B, SH-60F, HH-60H, MH-60R, and MH-60S. Able to deploy aboard any air-capable frigate, destroyer, cruiser, fast combat support ship, amphibious assault ship, or aircraft carrier, the Seahawk can handle anti-submarine warfare (ASW), anti-surface warfare (ASUW), naval special warfare (NSW) insertion, search and rescue (SAR), combat search and rescue (CSAR), vertical replenishment (VERTREP), and medical evacuation (MEDEVAC). During the 1970s, the U.S. Navy began looking for a new helicopter to replace the Kaman SH-2 Seasprite. The SH-2 Seasprite was used by the Navy as its platform for the Light Airborne Multi-Purpose System (LAMPS) Mark I avionics suite for maritime warfare and a secondary search and rescue capability. Advances in sensor and avionic technology lead to the LAMPS Mk II suite being developed by the Naval Air Development Center. The Navy then conducted a competition in 1974 to develop the Lamps MK III concept which would integrate both the aircraft and shipboard systems. The Navy selected IBM Federal Systems to be the Prime systems integrator for the Lamps MK III concept. Since the SH-2 was not large enough to carry the Navy's required equipment a new airframe was required. In the mid-1970s, the Army evaluated the Sikorsky YUH-60 and Boeing Vertol YUH-61 for its Utility Tactical Transport Aircraft System (UTTAS) competition. Navy based its requirements on the Army's UTTAS specification to decrease costs from commonality to be the new airframe to carry the Lamps MK III avionics. Sikorsky and Boeing-Vertol submitted proposals for Navy versions of their Army UTTAS helicopters in April 1977 for review. The Navy also looked at helicopters being produced by Bell, Kaman, Westland and MBB, but these were too small for the mission. In early 1978 the Navy selected Sikorsky's S-70B design, which was designated "SH-60B Seahawk". IBM was the prime systems integrator for the Lamps MK III with Sikorsky as the airframe manufacturer. The SH-60B maintained 83% commonality with the UH-60A. The main changes were corrosion protection, more powerful T700 engines, single-stage oleo main landing gear, removal of the left side door, adding two weapon pylons, and shifting the tail landing gear 13 feet (3.96 m) forward to reduce the footprint for shipboard landing. Other changes included larger fuel cells, an electric blade folding system, folding horizontal stabilators for storage, and adding a 25-tube pneumatic sonobuoy launcher on the left side. An emergency flotation system was originally installed in the stub wing fairings of the main landing gear; however, it was found to be impractical and possibly impede emergency egress, and thus was subsequently removed. Five YSH-60B Seahawk LAMPS III prototypes were ordered. The first YSH-60B flight occurred on 12 December 1979. The first production SH-60B made its first flight on 11 February 1983. The SH-60B entered operational service in 1984 with first operational deployment in 1985. The SH-60B is deployed primarily aboard frigates, destroyers, and cruisers. The primary missions of the SH-60B are surface warfare and anti-submarine warfare. It carries a complex system of sensors including a towed Magnetic Anomaly Detector (MAD) and air-launched sonobuoys. Other sensors include the APS-124 search radar, ALQ-142 ESM system and optional nose-mounted forward looking infrared (FLIR) turret. Munitions carried include the Mk 46, Mk 50, or Mark 54 MAKO Lightweight Torpedo, AGM-114 Hellfire missile, and a single cabin-door-mounted M60D/M240 7.62 mm (0.30 in) machine gun or GAU-16 .50 in (12.7 mm) machine gun. A standard crew for a SH-60B is one pilot, one ATO/Co-Pilot (Airborne Tactical Officer), and an enlisted aviation warfare systems operator (sensor operator). The U.S. Navy operated the SH-60B in Helicopter Anti-Submarine Squadron, Light (HSL) squadrons. All HSL squadrons were redesignated Helicopter Maritime Strike (HSM) squadrons and transitioned to the MH-60R between 2006 and 2015. After the SH-60B entered service, the Navy conducted a competition to replace the SH-3 Sea King. The competitors were Sikorsky, Kaman and IBM (avionics only). Sikorsky began development of this variant in March 1985. In January 1986, seven SH-60Fs were ordered including two prototypes (BuNos 163282/3). The first example flew on 19 March 1987. The SH-60F was based on the SH-60B airframe, but with upgraded SH-3H avionics. The SH-60F primarily served as the carrier battle group's primary antisubmarine warfare (ASW) aircraft. The helicopter hunted submarines with its AQS-13F dipping sonar, and carried a 6-tube sonobuoy launcher. The SH-60F is unofficially named "Oceanhawk". 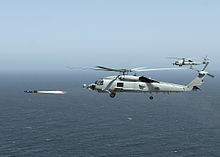 The SH-60F can carry Mk 46, Mk 50, or Mk 54 torpedoes for its offensive weapons, and it has a choice of fuselage-mounted machine guns, including the M60D, M240D, and GAU-16 (.50 caliber) for self-defense. The standard aircrew consists of one pilot, one co-pilot, one tactical sensor operator (TSO), and one acoustic sensor operator (ASO). 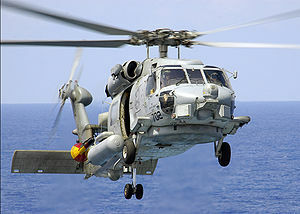 The SH-60F was operated by the U.S Navy's Helicopter Antisubmarine (HS) squadrons until they were redesignated Helicopter Sea Combat (HSC) squadrons transitioned to the MH-60S. The last HS squadron completed its transition in 2016. The HH-60H was developed in conjunction with the US Coast Guard's HH-60J, beginning in September 1986 with a contract for the first five helicopters with Sikorsky as the prime contractor. The variant's first flight occurred on 17 August 1988. Deliveries of the HH-60H began in 1989. The variant earned initial operating capability in April 1990 and was deployed to Desert Storm with HCS-4 and HCS-5 in 1991. The HH-60H's official DoD and Sikorsky name is Seahawk, though it has been called "Rescue Hawk". The HH-60H's standard crew is pilot, copilot, an enlisted crew chief, and two door gunners or one rescue swimmer. Originally operated by HCS-5 and HCS-4 (later HSC-84), these two special USNR squadrons were established with the primary mission of Naval Special Warfare and Combat Search and Rescue (CSAR). Due to SOCOM budget issues the squadrons were deactivated in 2006 and 2016 respectively. The HH-60H was also operated by Helicopter Antisubmarine (HS) squadrons with a standard dispersal of six F-models and two or three H-models before the transition of HS squadrons to HSC squadrons equipped with the MH-60S, the last of which completed its transition in 2016. The only squadron equipped with the HH-60H as of 2016 is HSC-85, one of only two remaining USNR helicopter squadrons (the other being HSM-60 equipped with the MH-60R). In Iraq, HH-60Hs were used by the Navy, assisting the Army, for MEDEVAC purposes and special operations missions. An MH-60R Seahawk conducts sonar operations. The MH-60R was originally known as "LAMPS Mark III Block II Upgrade" when development began in 1993 with Lockheed Martin (formerly IBM/Loral). Two SH-60Bs were converted by Sikorsky, the first of which made its maiden flight on 22 December 1999. Designated YSH-60R, they were delivered to NAS Patuxent River in 2001 for flight testing. The production variant was redesignated MH-60R to match its multi-mission capability. The MH-60R was formally deployed by the US Navy in 2006. The MH-60R is designed to combine the features of the SH-60B and SH-60F. Its sensors include the ASE package, MTS-FLIR, the AN/APS-147 multi-mode radar/IFF interrogator, an advanced airborne fleet data link, and a more advanced airborne active low frequency sonar (ALFS). It does not carry the MAD suite. Pilot instrumentation is based on a fully integrated glass cockpit, using several digital monitors instead of the complex array of dials and gauges in Bravo and Foxtrot aircraft. Offensive capabilities are improved by the addition of new Mk-54 air-launched torpedoes and Hellfire missiles. All Helicopter Anti-Submarine Light (HSL) squadrons that receive the Romeo are redesignated Helicopter, Strike Maritime (HSM) squadrons. During a mid-life technology insertion project, the MH-60R fleet shall be fitted with the AN/APS-153 Multi-Mode Radar with Automatic Radar Periscope Detection and Discrimination (ARPDD) capability. The Navy decided to replace its venerable CH-46 Sea Knight helicopters in 1997. 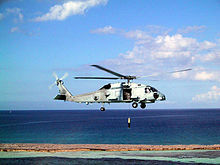 After sea demonstrations by a converted UH-60, the Navy awarded a production contract to Sikorsky for the CH-60S in 1998. The variant first flew on 27 January 2000 and it began flight testing later that year. The CH-60S was redesignated MH-60S in February 2001 to reflect its planned multi-mission use. The MH-60S is based on the UH-60L and has many naval SH-60 features. Unlike all other Navy H-60s, the MH-60S is not based on the original S-70B/SH-60B platform with its forward-mounted twin tail-gear and single starboard sliding cabin door. Instead, the S-model is a hybrid, featuring the main fuselage of the S-70A/UH-60, with large sliding doors on both sides of the cabin and a single aft-mounted tail wheel; and the engines, drivetrain and rotors of the S-70B/SH-60. It also includes the integrated glass cockpit developed by Lockheed Martin for the MH-60R and shares some of the same avionics/weapons systems. It is deployed aboard aircraft carriers, amphibious assault ships, Maritime Sealift Command ships, and fast combat support ships. Its missions include vertical replenishment, medical evacuation, combat search and rescue, anti-surface warfare, maritime interdiction, close air support, intelligence, surveillance and reconnaissance, and special warfare support. The MH-60S is to deploy with the AQS-20A Mine Detection System and an Airborne Laser Mine Detection System (ALMDS) for identifying submerged objects in coastal waters. It is the first US Navy helicopter to field a glass cockpit, relaying flight information via four digital monitors. The primary means of defense has been with door-mounted machine guns such as the M60D, M240D, or GAU-17/A. A "batwing" Armed Helo Kit based on the Army's UH-60L was developed to accommodate Hellfire missiles, Hydra 70 2.75 inch rockets, or larger guns. 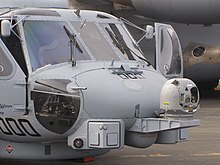 The MH-60S can be equipped with a nose-mounted forward looking infrared (FLIR) turret to be used in conjunction with Hellfire missiles; it also carries the ALQ-144 Infrared Jammer. 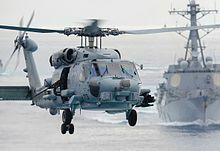 The MH-60S is unofficially known as the "Knighthawk", referring to the preceding Sea Knight, though "Seahawk" is its official DoD name. A standard crew for the MH-60S is one pilot, one copilot and two tactical aircrewmen depending on mission. With the retirement of the Sea Knight, the squadron designation of Helicopter Combat Support Squadron (HC) was also retired from the Navy. Operating MH-60S squadrons were re-designated Helicopter Sea Combat Squadron (HSC). The MH-60S was to be used for mine clearing from littoral combat ships, but testing found it lacks the power to safely tow the detection equipment. On 6 August 2014, the U.S. Navy forward deployed the Airborne Laser Mine Detection System (ALMDS) to the U.S. 5th Fleet. The ALMDS is a sensor system designed to detect, classify, and localize floating and near-surface moored mines in littoral zones, straits, and choke points. The system is operated from an MH-60S, which gives it a countermine role traditionally handled by the MH-53E Sea Dragon, allowing smaller ships the MH-53E can't operate from to be used in the role. The ALMDS beams a laser into the water to pick up reflections from things it bounces off of, then uses that data to produce a video image for technicians on the ground to determine if the object is a mine. A west coast Fleet Replacement Squadron (FRS), Helicopter Maritime Strike Squadron (HSM) 41, received the MH-60R aircraft in December 2005 and began training the first set of pilots. In 2007, the R-model successfully underwent final testing for incorporation into the fleet. In August 2008, the first 11 combat-ready Romeos arrived at HSM-71, a squadron assigned to the carrier John C. Stennis. The primary missions of the MH-60R are anti-surface and anti-submarine warfare. According to Lockheed Martin, "secondary missions include search and rescue, vertical replenishment, naval surface fire support, logistics support, personnel transport, medical evacuation and communications and data relay." HSL squadrons in the US have been incrementally transitioning to the MH-60R and have nearly completed the transition. The first MH-60Rs in Japan arrived in October 2012. The recipient was HSM-51, the Navy's forward–deployed LAMPS squadron, home based in Atsugi, Japan. The Warlords transitioned from the SH-60B throughout 2013, and shifted each detachment to the new aircraft as they returned from deployments. HSM-51 will have all MH-60R aircraft at the end of 2013. The Warlords are joined by the Saberhawks of HSM-77. On 23 July 2013, Sikorsky delivered the 400th MH-60, an MH-60R, to the U.S. Navy. This included 166 MH-60R versions and 234 MH-60S versions. The MH-60S is in production until 2015 and will total a fleet of 275 aircraft, and the MH-60R is in production until 2017 and will total a fleet of 291 aircraft. The two models have flown 660,000 flight hours. Seahawk helicopters are to remain in Navy service into the 2030s. The SH-60B Seahawk completed its last active-duty deployment for the U.S. Navy in late April 2015 after a seven-month deployment aboard USS Gary. After 32 years and over 3.6 million hours of service, the SH-60B was formally retired from U.S. Navy service during a ceremony on 11 May 2015 at Naval Air Station North Island. In late November 2015 USS Theodore Roosevelt returned from its deployment, ending the last active-duty operational deployment of both the SH-60F and HH-60H. The models are to be transferred to other squadrons or placed in storage. Australia originally acquired 16 S-70Bs the in the 1980s. Australia requested approval to buy 24 MH-60Rs through a Foreign Military Sale in July 2010. The MH-60R and the NHIndustries NH90 were evaluated by the Royal Australian Navy. On 16 June 2011, it was announced that Australia would purchase 24 of the MH-60R variant, to come into service between 2014 and 2020. The helicopter was selected to replace the RAN's older Seahawks. The last of the 24 MH-60Rs was delivered to the RAN in September 2016. The S-70B-2 Seahawks were retired in December 2017 after 28 years in service with 11 have been sold to Skyline Aviation Group. The Royal Danish Navy (RDN) put the MH-60R on a short list for a requirement of around 12 new naval helicopters, together with the NH90/NFH, H-92, AW159 and AW101. The Request For Proposal was issued on 30 September 2010. In November 2010, Denmark requested approval for a possible purchase of 12 MH-60Rs through a Foreign Military Sale. In November 2012, Denmark selected 9 MH-60Rs to replace its 7 aging Lynx helicopters. In October 2015, the US Navy accepted two mission ready MH-60R helicopters for Denmark. In October 2018, Lockheed Martin was in the process of delivering the ninth and final MH-60R to Denmark. In July 2009, the Republic of Korea requested eight MH-60S helicopters, 16 GE T700-401C engines, and related sensor systems to be sold in a Foreign Military Sale. However, South Korea instead chose the AW159 in January 2013. In July 2010 Tunisia requested 12 refurbished SH-60Fs through a Foreign Military Sale. But the change in government there in January 2011 may interfere with an order. In February 2011, India selected the S-70B over the NHIndustries NH90 for an acquisition of 16 multirole helicopters for the Indian Navy to replace its aging Westland Sea King fleet; the order includes an option for 44 additional helicopters. India selected the Seahawk and confirmed procurement in November 2014. In June 2017 however, India's Ministry of Defence had terminated the procurement program over a pricing issue. In 2011, Qatar requested a potential Foreign Military Sale of up to 6 MH-60R helicopters, engines and other associated equipment. In late June 2012, Qatar requested another 22 Seahawks, 12 fitted with the armed helicopter modification kit and T700-401C engines with an option to purchase an additional six Seahawks and more engines. In 2011, Singapore bought six S-70Bs and then in 2013 ordered an additional two. In early 2015, Israel ordered eight ex-Navy SH-60Fs to support the expansion of the Israeli Navy surface fleet for ASW, ASuW and SAR roles. In 2015, Saudi Arabia requested the sale of ten MH-60R helicopters and associated equipment and support for the Royal Saudi Navy. In 2016, Malaysia is considering a purchase of new helicopters for its Royal Malaysian Navy, with the MH-60R Seahawk, AgustaWestland AW159 Wildcat, or the Airbus Helicopters H225M under evaluation for the role. In April 2018, the Defense Security Cooperation Agency announced it had received U.S. State Department approval and notified Congress of a possible sale to Mexican Navy of eight MH-60Rs, spare engines, and associated systems. Mexico's president said that he plans to cancel the MH-60 sale to cut government spending. In August 2018, India's Defence Ministry approved the purchase of 24 MH-60R helicopters to replace their fleet of Westland Sea Kings. In April 2019, US approved sale of 24 anti-submarine hunter helicopters to India including spare parts for USD 2.6 bn. The Trump Administration on Tuesday notified the Congress that it has approved the sale of 24 MH-60R multi-mission helicopters, which will provide the Indian defence forces with the capability to perform anti-surface and anti-submarine warfare missions. SH-60B Seahawk: Anti-submarine warfare helicopter, equipped with an APS-124 search radar and an ALQ-142 ESM system under the nose, also fitted with a 25-tube sonobuoy launcher on the left side and modified landing gear; 181 built for the US Navy. CH-60E: Proposed troop transport version for the U.S. Marine Corps. Not built. SH-60F "Oceanhawk": Carrier-borne anti-submarine warfare helicopter, equipped with dipping sonar; 76 built for the U.S. Navy. HH-60H "Rescue Hawk": Search-and-rescue helicopter for the U.S. Navy; 42 built. XSH-60J: Two U.S.-built pattern aircraft for Japan. SH-60J: Anti-submarine warfare helicopter for the Japanese Maritime Self-Defense Force. HH-60J/MH-60T Jayhawk: U.S. Coast Guard version. The HH-60J was developed with the HH-60H, the MH-60T is an upgrade to the HH-60J. S-70B-2 Seahawk: Anti-submarine version for the Royal Australian Navy, similar to the SH-60B Seahawk in U.S. Navy operation. S-70B-3 Seahawk: Anti-submarine version for the Japanese Maritime Self-Defense Force. Also known as the SH-60J. The JMSDF ordered 101 units, with deliveries starting in 1991. S-70B-6 Aegean Hawk: the Greek military variant which is a blend of the SH-60B and F models, based on Republic of China (Taiwan) Navy's S-70C(M)1/2. S-70C-6 Super Blue Hawk: Search-and-rescue helicopter for Taiwan, equipped with undernose radar, plus provision for four external fuel tanks on two sub wings. ^ "MH-60R Selected Acquisition Report (SAR)" (PDF). US Department of Defense. 31 December 2011. p. 11. Archived from the original (pdf) on 5 March 2013. Retrieved 2013-04-27. ^ "MH-60S Selected Acquisition Report (SAR)" (PDF). US Department of Defense. 31 December 2011. p. 14. Archived from the original (pdf) on 16 September 2012. Retrieved 2013-04-27. ^ a b c Leoni 2007, pp. 203–4. ^ a b Sikorsky S-70B Seahawk, Vectorsite.net, 1 July 2006. ^ Eden, Paul. "Sikorsky H-60 Black Hawk/Seahawk", Encyclopedia of Modern Military Aircraft, p. 431. Amber Books, 2004. ISBN 1-904687-84-9. ^ Leoni 2007, pp. 206–9. ^ Mitsubishi (Sikorsky) SH-60J (Japan). Jane's, 17 April 2007. ^ Leoni 2007, p. 211. ^ "Bureau (Serial) Numbers of Naval Aircraft" (PDF). ^ a b c Donald 2004, p. 158. ^ Donald 2004, pp. 161–162. ^ "MH-60R Seahawk - NAVAIR - U.S. Navy Naval Air Systems Command - Navy and Marine Corps Aviation Research, Development, Acquisition, Test and Evaluation". www.navair.navy.mil. ^ Donald 2004, p. 161. ^ "MH-60R Equipment Guide". Military.com. Archived from the original on 1 November 2007. Retrieved 4 December 2012. ^ "Telephonics to supply AN/APS-153 radars for US MH-60R aircraft". Naval Technology. 26 April 2012. Retrieved 4 December 2012. ^ a b Donald 2004, pp. 159–160. ^ a b Donald 2004, pp. 160–161. ^ "MH-60S Knighthawk — Multi-Mission Naval Helicopter, USA". Naval Technology. Retrieved 2008-10-05. ^ a b "SH-60 Seahawk fact file". US Navy. 21 August 2015. Retrieved 22 April 2018. ^ LaGrone, Sam. "MH-60S underpowered for MCM towing operations, report finds." Jane's Information Group, 21 January 2013. ^ a b Donald 2004, pp. 156–157. ^ Tomajczyk 2003, p. 55. ^ Leoni 2007, p. 205. ^ "MH-60R Helicopter Departs Lockheed Martin To Complete First Operational Navy Squadron" Archived 2008-08-15 at the Wayback Machine. Lockheed Martin, July 30, 2008. ^ Alford, Abbie (11 May 2015). "Navy retires the SH-60B Seahawk". San Diego: CBS 8. ^ Leoni 2007, pp. 303-304. ^ "Spain – Refurbishment of SH-60F Multi-Mission Utility Helicopters" Archived 2011-12-01 at the Wayback Machine. US Defense Security Cooperation Agency, 30 September 2010. 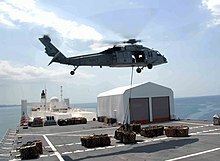 ^ "Spain seeks more Seahawk helicopters". Retrieved 2010-10-07. ^ "Australia – MH-60R Multi-Mission Helicopters" Archived 2011-07-16 at the Wayback Machine. US Defense Security Cooperation Agency, 9 July 2010. ^ "Australia requests US helicopters". Rotothub, 29 April 2010. ^ "MH-60R or NH90 NFH - Australia plans to buy 24 naval combat helicopters" Archived 2010-08-10 at the Wayback Machine. Defpro.com, 29 April 2010. ^ "Final RAN Seahawk Romeo handed over". Australian Aviation. 12 September 2016. Retrieved 14 September 2016. ^ Dominguez, Gabriel (1 December 2017). "RAN retires S-70B-2, AS350BA helicopters". IHS Jane's 360. Archived from the original on 4 December 2017. Retrieved 4 December 2017. ^ "Denmark – MH-60R Multi-Mission Helicopters" Archived 2010-12-14 at the Wayback Machine. US Defense Security Cooperation Agency, 30 November 2010. ^ Hoyle, Craig. "Denmark requests Seahawk helicopter buy". Flightglobal.com, 13 December 2010. Retrieved: 14 December 2010. ^ Hoyle, Craig. "Denmark confirms MH-60R selection to replace Lynx helicopters". Flightglobal.com, 21 November 2012. Retrieved: 21 November 2012. ^ Tringham, Kate (23 October 2018). "Euronaval 2018: Lockheed Martin prepares to deliver final Danish MH-60R helicopter, eyes future markets". IHS Jane's 360. Paris. Archived from the original on 24 October 2018. Retrieved 30 October 2018. ^ "Korea – MH-60S Multi-Mission Helicopters" Archived 2009-08-06 at the Wayback Machine. US Defense Security Cooperation Agency, 22 July 2009. ^ "Tunisia – Refurbishment of Twelve SH-60F Multi-Mission Helicopters" Archived 2010-07-14 at the Wayback Machine. US Defense Security Cooperation Agency, 2 July 2010. ^ "SH-60F Seahawk Helis for Tunisia". Retrieved 1 June 2017. ^ "India to go for open bidding for Navy deal, rejects US offer". Economic Times, 18 February 2011. ^ Bedi, Rahul (15 June 2017). "India scraps planned acquisition of S-70B Seahawk helos". IHS Jane's 360. New Delhi. Archived from the original on 15 June 2017. Retrieved 15 June 2017. ^ "Qatar – MH-60R and MH-60S Multi-Mission Helicopters" Archived 2012-07-22 at the Wayback Machine. US Defense Security Cooperation Agency, 28 June 2012. ^ Sambridge, Andy (30 June 2012). "Qatar keen on $2.5bn US helicopters deal". ArabianBusiness.com. Retrieved 1 July 2012. ^ Waldron, Gregg (February 20, 2013). "Singapore orders two additional S-70B helicopters". Flightglobal. Retrieved February 2, 2015. ^ "צפו: המסוק החדש של חיל הים מפגין ביצועים". 18 February 2015. Retrieved 1 June 2017. ^ "Kingdom of Saudi Arabia – MH-60R Multi-Mission Helicopters". www.defense-aerospace.com. Retrieved 1 June 2017. ^ "Kingdom of Saudi Arabia – MH-60R Multi-Mission Helicopters - The Official Home of the Defense Security Cooperation Agency". www.dsca.mil. Retrieved 1 June 2017. ^ "US State Department approves sale of MH-60R helicopters to Mexico". navaltoday.com. ^ "Mexico – MH-60R Multi-Mission Helicopters". US DSCA. 19 April 2018. Retrieved 2 May 2018. ^ Aroor, Shiv (27 August 2018). "India Clears Decks For 24 American MH-60 Romeo Helicopters For Navy". Livefist. Swarajya. Retrieved 18 January 2019. ^ a b c DoD 4120-15L, Model Designation of Military Aerospace Vehicles. US DoD, 12 May 2004. ^ Donald, David, ed. "Sikorsky S-70". The Complete Encyclopedia of World Aircraft. Barnes & Noble Books, 1997. ISBN 0-7607-0592-5. ^ "S-60B (SH-60B Seahawk, SH-60F CV, HH-60H Rescue Hawk, HH-60J Jayhawk, VH-60N) - Sikorsky Archives". Sikorsky Aircraft. ^ a b c d e f g h i j k l Hoyle, Craig (4 December 2018). "ANALYSIS: 2019 World Air Forces Directory". Flightglobal Insight. Retrieved 14 April 2019. ^ "Seahawk operative". Danish Defense Force. Retrieved 30 May 2018. ^ "The US State Department has cleared the sale of 24 Lockheed Martin MH-60R". flightglobal.com. Retrieved 3 April 2019. ^ "Israel finalises Seahawk sensor configuration". Flight Global. 25 September 2017. Retrieved 2019-04-14. ^ "Israel - Excess SH-60F Sea-Hawk Helicopter Equipment and Support". dsca.mil. 6 July 2016. Retrieved 2019-04-14. ^ S-70B Seahawk Mission Brochure. Sikorsky.com. 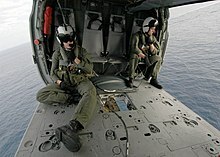 Wikimedia Commons has media related to SH-60 Seahawk.